Published: Sept. 8, 2014 at 01:04 p.m. Updated: Sept. 8, 2014 at 02:02 p.m.
Before Sunday, if I'd shared a story involving several Buffalo Bills powerbrokers, screaming and slamming into lockers, you'd have assumed it detailed another blowup between coach Doug Marrone, general manager Doug Whaley and team president Russ Brandon -- or, possibly, a surprise appearance by prospective owner Jon Bon Jovi at Ralph Wilson Stadium. Unless you have ESP or just emerged from a Hot Tub Time Machine, you would not have expected an anecdote about what was likely the most emotional victory of the 2014 NFL season's opening weekend. And yet, there were Brandon, Whaley and a handful of other Bills officials Sunday afternoon, having retreated to the Soldier Field visitors' locker room to watch the latter stages of the Bills' overtime clash with the favored Chicago Bears, celebrating like Little League World Series winners as the team's oldest player brought them to the brink of glory. Yes, Fred Jackson's stiff-arm-fueled, 38-yard run down the left sideline, which set up Dan Carpenter's game-winning 27-yard field goal, was that good. "I almost knocked myself out running into the lockers," Brandon said late Sunday night, having returned to Western New York on a jubilant flight home. "I was screaming. We were all screaming. It was a great moment for everybody. And it was a really emotional day." With the Bills playing a meaningful game for the first time since the March 25 death of franchise founder Ralph Wilson, Brandon got choked up when presenting the game ball to the late owner's widow, Mary, in the aftermath of the Bills' 23-20 victory. However, Sunday carried overtones that were far more than ceremonial. 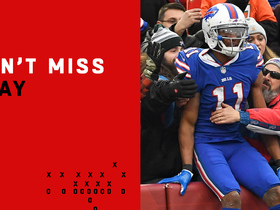 This was a game the Bills desperately needed to pull out, partly because they'd endured a tumultuous stretch that did not seem to bode well for the 2014 season -- and partly because it was the precise situation that typically provokes heartbreak in Buffalo, where fans have endured a league-worst streak of 14 seasons without a playoff appearance. 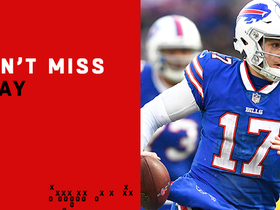 As one member of the organization put it, "That's a game the Buffalo Bills historically lose. And it would have been tough to lose, given all the uncertainty surrounding the sale of the team, and all the talk of turmoil, and the fact that we blew in the preseason. So yeah, it was slightly big." In other words, losing was untenable. And Jackson, bless his 33-year-old soul, seemed to embark upon that game-deciding overtime jaunt as though he possessed such a mentality. After taking a shotgun handoff from quarterback EJ Manuel and slipping through a hole to his left, Jackson darted to the sidelines, determined to finish off the team's first-ever victory in Chicago. As Bears safety Chris Conte closed in near the 20-yard line, Jackson -- in a show of force that evoked images of his good friend and former teammate, Seahawks Pro Bowl halfback Marshawn Lynch -- extended his right arm and knocked Conte off balance. At the 10, Jackson stiff-armed Conte again, this time sending him ingloriously to the ground (in Bills linebacker Brandon Spikes' words: "Kinda embarrassing -- like, come on, man") and dove for the pylon, getting knocked out one yard short by Chicago linebacker Jon Bostic. "We've got to win," Jackson said, recalling his mindset on the play as he rode the team bus from the stadium to the airport. "It was definitely one of those moments -- I'd had an opportunity to talk to C.J. 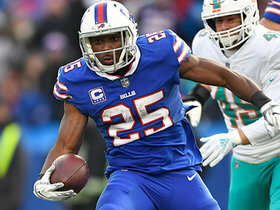 (Spiller, the running back ahead of Jackson on the depth chart, whose 7-yard touchdown catch gave Buffalo a 17-7 second-quarter lead) about that on the sidelines late in the fourth quarter. We've been in a bunch of these situations over the years and haven't been able to finish. "We've got to get this turned around -- and to do that, you've got to tune out all the noise and find a way to pull these games out." Ah, the noise: Over the past few months, the Bills have been subjected to more of that than a Bon Jovi roadie -- and yes, Bills fans, you can curse me for invoking the name of the least popular man in Western New York. With the team in the process of being sold in the wake of Wilson's death, and uncertainty about whether a new ownership group might attempt to move the franchise, Bon Jovi -- since booted from a prospective group that includes Toronto-based entertainment executives -- became a symbol of distrust. This was unfortunate, as "Livin' On A Prayer" might have served as an appropriate anthem for the team's 2014 preseason performance. The Bills could also have Donald Trump as their new owner, which if nothing else might make for some intriguing "You're Fired" scenes on an upcoming season of "Hard Knocks." Understandably, job security is a scarce commodity in the Bills' organization, a point seemingly underscored by Whaley's draft-day trade of a 2015 first-round pick (and a 2015 fourth-rounder) to the Cleveland Browns so that Buffalo could move up five spots and snag Clemson wideout Sammy Watkins with the fourth overall selection. And Whaley's decision a little more than one week ago to sign 31-year-old quarterback Kyle Orton to a two-year, $11 million contract, giving the team an alternative should Manuel falter in his second season, looked like another move by a regime with a win-or-else mentality. The Orton signing, according to a highly placed source, wasn't what triggered the "heated argument" between Marrone and his bosses that was detailed in a CBS Sports report last Friday. However, the tension within the organization has been palpable, much of it stemming from a disappointing preseason in which Manuel and the starting offense failed to score a touchdown against a first-string defense in five games. 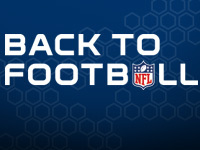 Throw in the fact that the Bills were subjected to the NFL's longest training camp this summer, and, as Spikes said late Sunday night, "It was time to make somebody pay." Yet early in Sunday's game, it didn't look like those somebodies would be the Bears: After forcing a quick three-and-out, Chicago drove 66 yards and took an early 7-0 lead on Jay Cutler's 12-yard touchdown pass to Martellus Bennett. Buffalo fans had seen this movie before. 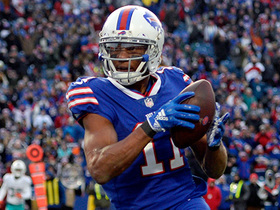 The Bills flipped the script, however, scoring 17 consecutive points before halftime. Later, they would shake off a pair of game-tying comebacks by the Bears -- the second, which forced overtime, included a flag for offensive holding that would have negated a third-down conversion but was picked up by an official following Cutler's 15-yard completion to Brandon Marshall. How many times do you see that happen? The Bears had the first shot at winning in overtime, but the physical, boisterous Spikes -- signed in March after four seasons with the AFC East rival New England Patriots (who, by the way, sit in last place behind the Bills, Miami Dolphins and New York Jets) -- and his fellow defenders forced a quick punt. Two plays after Manuel's crisp, 20-yard pass to wideout Mike Williams, Jackson took that fateful handoff and stiff-armed Conte into submission -- and it was all over but the screaming. "I was on the sideline with my mouth wide open," Spikes said. "I couldn't believe it, man -- it was just a determination play. It was definitely a win I'll remember forever. There was something different about it, honestly." Now in his ninth season with the Bills, Jackson wholeheartedly agreed. "It does feel different," he said. "We had never won in this stadium. It could be the spark we need to get this changed and end that streak of not getting to the playoffs." If that happens, there will be some serious noise coming out of Western New York.